VOM meter case. Empty, no cover. Plastic, gray. New, unused. 6-3/8" x 4-9/16" x 2-1/16"H.
Black satin thermo-plastic project box exactly the same as above except this one has a satin finish which means....no fingerprints!!! Potter & Brumfield relay enclosure project box. 8 pin octal plug. Make your circuit removable. Black instrument case. Includes 16 guage aluminum lid. 6-32nd tapped brass screws insert in to each corner to mount lid. Screws not included. External dimensions: 6-7/8" x 5-5/16" x 2-5/16"H with 5/32" thick walls. Black instrument case with three pre-drilled holes. Battery holder mounted inside case holds 2 "C" cell batteries. 6 brass screw inserts for lid. (Lid NOT available). External dimensions: 3" high x 8-7/16" deep x 7-7/16" wide. Black Dakaware box. 6 brass screw inserts for lid. (Lid NOT available). External dimensions: 3" high x 8-7/16" deep x 7-7/16" wide. Harry Davies Molding Company. High quality black thermosetting plastic case has glass like finish and 6-32 brass inserts for cover mounting screws. A perfect box for instruments or a multitude of projects. Lid not available. High quality black thermosetting plastic case same as left but no brass inserts. Black. 3-1/2"H x 2-1/2"W x 1-1/4"D. Lid not available. High quality black thermosetting plastic case same as left. Has 6-32 brass inserts for cover mounting screws. Black. 6-13/16"H x 5-1/4"W x 2-1/4"D. Lid not available. Remote control enclosure. Clam shell design fastens with center screw (not included) through back cover. On / Off switch holes on cover. Removable battery compartment lid. Labeled "Home Safe Corporation". O.D. max dimensions 7/8" x 2-1/8" x 3-3/4". Divider parts box. New, old stock. Heavy, soft plastic. Box measures: 11" x 6-3/4" x 2-3/8". 6 compartments measure: 6-1/4" x 2-1/4" x 1-3/4" each. Scientific Radio SR610/640 antenna coupler raintight case. Great for any outdoor tuner or switch application. 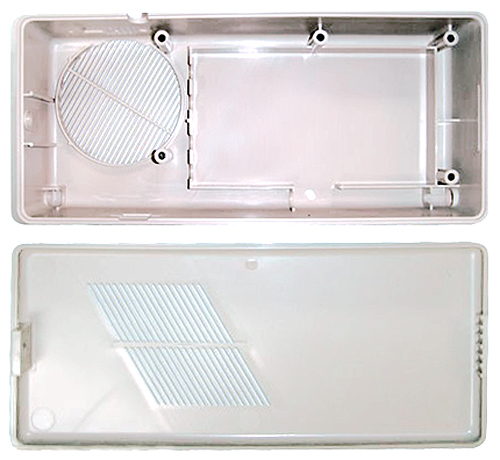 Removable lid with o-ring gasket. 6" high x 12" wide x 14" long. Several pre-drilled factory connector holes. Gray plastic / fiberglass material. Mfg: Hoffman. 9.73" x 7.73" x 3.98"
Scientific Radio SR604 antenna coupler case. Fiberglass reinforced polyester enclosure with watertight cover. Molded in flange for ease of mounting. Hole on one side for ceramic insulator mounting. Holes in other side for SO-239, ground and 1-7/16" diameter connector. Great for 100w remote antenna tuner. Made by Stahlin. Scientific Radio SR-680 antenna coupler raintight case. Great for any outdoor tuner or switch application. Removable lid with o-ring gasket. 8-1/2" high x 15-1/4" long x 12" wide. Several pre-drilled factory connector holes. Gray plastic / fiberglass material. Mfg: Hoffman. 7-7/16" wide x 1-3/4" high x 3-1/4" deep. Grilled 2-1/4" hole for mounting speaker. Very sturdy plastic box, can be used for many different purposes. Speaker grill 2.25"D, posts 2" O.C. Posts at bottom of case 2-5/16" O.C. Distance from bottom post to speaker post: 4-13/16". Case back is 0.338" deep. We have no manufacturer's specs as these were acquired in a surplus liquidation. At the steep price of 35¢ each (25¢ for 25+), we recommend you take the plunge. 50 pieces plus shipping is about $25. Rose watertight poly-enclosures with o-rings. 4 corner screw-down fasteners are outside of o-ring. Great for outdoor / tower projects. 2-3/16" high x 3-1/8" wide x 3-3/16" long. 5/32" thick walls. Relay cover, no bottom. Hole in top corner. Gray, plastic. Ballantyne. 1-1/2" x 3" x 2-3/4"H.
2-1/2" wide x 1-1/4" high x 3-13/16" deep. Screws together, grooved for mounting panel or face plate.